Dermal fillers, including lip injections, are a great way to help you look younger naturally by making the skin more plump. Injections are safe, fast, and are primarily made of natural ingredients found in the body. There is no down time so you are ready to return to your busy South Bay lifestyle immediately! All Juvederm treatments are hyaluronic fillers, though there are subtle differences between formulas. We offer all forms of Juvederm in our South Bay spa. Juvederm Ultra & Ultra XC – works to help smooth out moderate wrinkles and folds with a softer solution than Juvederm Ultra Plus. The XC formula is manufactured with an anesthetic included and 90% of patients report less pain with Juvederm XC injections than the regular Ultra Plus formula. Effects will be visible immediately and the treatment can last for up to one year. After your Juvederm injection you can return to your busy life with little to no down time. Juvederm Ultra Plus & Ultra Plus XC – for the patient with more severe folds and wrinkles, Juvederm Ultra Plus injections are a great choice. Ultra Plus has a higher concentration of HA and a higher viscosity than Juvederm XC and is a great, non-invasive alternative to a facelift. Juvederm Ultra Plus is one of the most effective fillers for the nasolabial folds (the “parentheses” around the mouth) and a down turning smile. Juvederm Ultra Plus is one of the first fillers to be approved for all skin tones and nationalities. In studies it has continually proven to show no increase in hyperpigmentation or scarring. Effects can last for up to a year but are influenced by unique patient factors such as the area treated, lifestyle, and age. Treatments usually take 30-60 minutes including numbing time in our comfortable, private South Bay spa and no one will suspect you’ve had anything “done”, just that you look well rested and younger! One of the most popular dermal fillers in spas worldwide, Restylane was the first FDA approved hyaluronic filler on the market and we are proud to offer it in our Redondo Beach spa. This is an acid that occurs naturally in the skin and gives it a plump, youthful appearance. Restylane can restore some of the acid that is lost with age and will give your skin the glowing fullness of your youth. It can be used as a lip filler, to contour the chin and cheeks, and also can fill deep wrinkles and folds. Radiesse is the only dermal filler made from calcium which allows it to work with your body to help create new collagen. The unique combination of interactions makes Radiesse treatments effective for up to a year upon injection and effects are immediate. Your skin will look more youthful instantly. Radiesse fills deep wrinkles from any sun damage you may’ve gotten on the beach and is also very useful in sculpting high cheekbones and fixing sagging jaw lines. We recommend this product for any client that is seeking a more youthful complexion. Injections are quick, safe, side effects minimal, and give you natural looking results. Like Restylane , Perlane is a FDA approved hyaluronic filler that gives the skin more volume, making it as smooth as when you were young. It contains a slightly higher concentration of hyaluronic acid which makes it one of the strongest fillers in the category. Perlane is a great choice if you desire fuller lips, or to enhance the chin or cheeks. It can help to minimize acne scars, deep set wrinkles, and soften the appearance of jowls. Much like Botox, it can also be used as a temporary eyebrow lift, giving the eyes a more open, youthful appearance. The dominant ingredient in Perlane is hyaluronic acid, a naturally occurring substance in the body. This makes it an organic, non-invasive anti-aging product. Injections can be done right in our office and take 15 – 30 minutes, depending on the size of the treatment area. The treatment will be effective for up to 12 months. Belotero is the newest filler to be FDA approved for the treatment of fine lines and wrinkles. We love this product for those hard to get crow’s feet and smoker’s lines around the mouth that aren’t responding well enough to Botox alone. This is also a great choice for anyone new to fillers and wanting the softest and most natural look. Because of the low viscosity of this product, it blends easily into the tissues, helping to naturally correct surface wrinkles while still allowing your inner beauty to shine through. With Belotero there is less risk of any bluish hue (called a tyndall effect) beneath the skin that can occur when higher concentration HA fillers are injected too close to the skin’s surface. For this reason, it can be placed much more superficially than any other filler to address even the finest line. The versatility of Belotero makes it a good choice for other areas such as smile lines, undereye tear troughs, and lips. Treatments take 30-60 minutes including numbing time, patients report minimal pain or side effects. Belotero injections can be given at our South Bay location, with same day appointments often available. Because HA is a natural filler that is gradually absorbed by the body it is a low risk and highly effective way to treat fine lines and wrinkles. Voluma is the latest and greatest addition to the FDA approved dermal filler family. 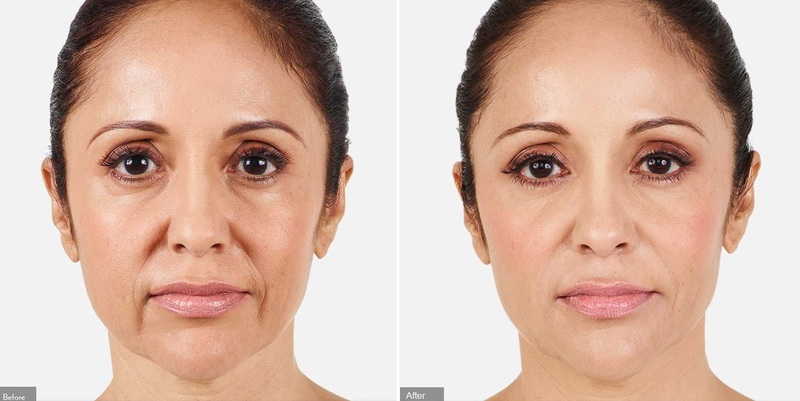 Approved for mid-face volumizing, Voluma is the first of it’s kind to truly be used as an alternative to surgery for sagging, sinking, aging faces. With no greater downtime or side effects than any of the traditional fillers, Voluma can take years off a face with just a few pokes, no cutting, no anesthesia. The main differences between Voluma and other dermal fillers, are the injection technique, duration of effect, and volume of product used. For an average female face, to achieve optimal lifting and volumizing, 4 mL’s of product are required. However, the duration of effect is twice that of other fillers at around 2 years. *Consultations are always FREE and can be done in under 20 minutes. Pricing will vary based on an individual’s needs and goals. For this reason, quotes cannot be given over the phone, although we strive to be extremely competitive and fair in our pricing.